Churches in Malaysia have come under attack after a court ruling permitted Christians to use the word "Allah" in publications. In the wake of the ruling, nine church buildings had been attacked around the country, though no injuries have been reported. The controversy has dragged on since 2007, with Herald—the Catholic Weekly, the main Catholic newspaper in the country, challenging a government ban on Christians using the word "Allah" in Malay-language literature to refer to God. One effect of the government ban has been that thousands of Bibles printed in nearby Indonesia, which has more Muslims than any other country, have been confiscated by the Malaysian authorities because they employ the word "Allah" for God. The government has challenged the court ruling, prompting the judiciary to issue a stay on its implementation. 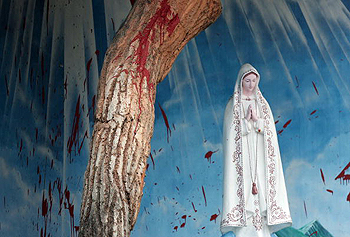 Malaysian Prime Minister Najib Razak visited one of the vandalized churches, issuing a call for calm while reminding Malaysians that Islam forbids such attacks. After briefing foreign diplomats on the situation on January 11, Home Ministry Secretary General Mahmood Adam said, "These outrageous incidents are acts of extremism and designed to weaken our diverse communities' shared commitment to strengthen racial unity." Malaysia remains somewhat anomalous for its use of the word "race" to denote ethnic and religious differences among the Malay, Chinese and Indian groups that make up its 27 million people. Despite the condemnatory words, the government's appeal suggests that it seeks to exploit the controversy for political gain. The opposition parties have endorsed the court's decision; in particular, Malaysia's sole self-declared Islamist party, PAS, which is growing in size and strength and is a key opposition player, contends that Christians have Quranic sanction to say "Allah." The government has argued that Christian use of the word "Allah" will confuse Muslims and promote conversions from Islam, which are illegal under Malaysian law. Malaysian law "provides for freedom of religion." Article 11 of the Malaysian Constitution states, "Every person has the right to profess and practice his religion," but also gives state and federal governments the power to "control or restrict the propagation of any religious doctrine or belief among persons professing the religion of Islam." Moreover, Article 3 of the same document outlines that "Islam is the religion of the federation" and that "Parliament may by law make provisions for regulating Islamic religious affairs." Like Sudan, another country with a Muslim majority and sizeable Christian/non-Muslim minority, Malaysia maintains a dual legal system, with sharia (Islamic law) courts ruling on religious and family issues involving Muslims, and secular courts ruling on other issues relevant to the broader population. Fifty-six Islamic sects that are considered "deviant" and a threat to national security have been blacklisted. Along similar lines, the Malaysian government has treated the "Allah" dispute as a national security issue. A recent Pew Forum on Religion and Public Life study of restrictions placed on religion put Malaysia among the 10 most prohibitive countries, alongside the likes of China, Burma, Saudi Arabia, Eritrea and Iran. However, the same report said that Malaysia did not have a history of religiously based "social hostilities." Could this be about to change? "For non-Muslims to use this word is an unnecessary provocation," said Faisal Aziz, president of the National Union of Malaysian Muslim Students, a group that has muscled in to prevent concerts by Western acts such as Beyonce, Gwen Stefani and others from taking place in Malaysia and has organized protest rallies over the weekend following the court decision. Bridget Welsh, professor of Southeast Asian studies at Singapore Management University, insisted that this controversy will undermine the country's reputation overseas, and that foreign investment and tourism are central to the country's economy. "Malaysia's international image of multiethnic harmony has evaporated, and this will take a long time to repair," Welsh said. She warned that the dispute will affect investor confidence. Similarly, the United States Commission on International Religious Freedom has voiced concern, saying leaders' response to the crisis would be vital in shaping the nation's future, according to Agence France Presse.? "How Malaysian leaders settle these matters will determine that country's political and economic future," said Commission Chairman Leonard Leo. Malaysian Christians say that they have used the word "Allah" for hundreds of years, as have Malaysian Muslims, since Arab traders brought their religious terminology to the region as far back as the 12th century. The controversy has not arisen elsewhere. Bishop Paul Hinder, who is based in Abu Dhabi, United Arab Emirates, heads the Catholic diocese covering six countries in the Arabian Peninsula. He said Arabic-speaking Christians have always used the word "Allah," which as the Arabic word for "God" even predates the founding of Islam. The issue has implications for Malaysia's simmering political divisions, with non-Malays now chafing at the Malay-dominated government, which has been in power since full independence from Great Britain was gained in 1957. In Malaysia's ethnic and religious makeup, all ethnic Malays are by law listed as Muslims, making up around 60 percent of the population. The remainder is comprised of Chinese-Malays and Indian-Malays, who are mainly Buddhists, Christians and Hindu. Most of Malaysia's Catholics live in the eastern provinces of Sabah and Sarawak. Ooi Kee Beng is a Malaysian politics scholar at Singapore's Institute for Southeast Asian Studies. He told the Register that the government appeal keeps the issue alive, "strengthening further the suspicion that it sees the courts as purely a means at its disposal and not as the embodiment of right and wrong." The government could be seeking to burnish its Islamist credentials, playing a tribal card to try to make PAS seem soft by comparison, and Kee Beng suggested that elements within the governing Malay party could use this issue to incite violence for political ends. Jamil Khir Baharom, an official in the Prime Minister's Department, has urged church leaders to try asking their flocks to drop the claim to use the name "Allah." The attacks could be an attempt to sway the judges' decision when the appeal is heard, with the implication that Malaysia's ethnic and religious relations, as well as its economic well-being, could be jeopardized unless the decision is revoked. This article was originally published by The National Catholic Register: http://www.ncregister.com/.